SpringHill Suites Phoenix Chandler/Fashion Center looks forward to welcoming guests to our Chandler, AZ hotel near Chandler Fashion Center and the cities of Phoenix, Scottsdale, Mesa, and Tempe. Corporate travelers enjoy our close proximity to local businesses such as Intel, Bank of America, Microchip, PayPal, Republic Services, Wells Fargo and more. Shop til you drop at the Chandler Fashion Center within walking distance, or enjoy great gaming at Gila River Casino. Visiting town for MLB Spring Training? 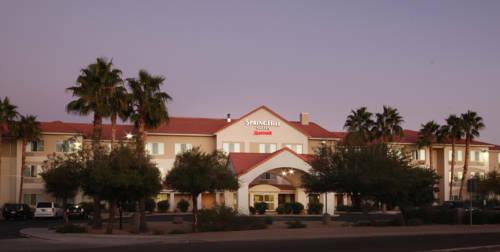 The SpringHill Suites Chandler is minutes from Tempe Diablo Stadium, Sloan Park, and HoHoKam Stadium. Our spacious suites were designed with modern amenities to ensure your comfort. Enjoy free WiFi, separate spaces for sleeping and working, plus an in-room kitchenette with mini-fridge, microwave, and more. Start your day off right with our breakfast buffet, serving a selection of morning favorites. At our SpringHill Suites Chandler hotel, your comfort is our priority. We can t wait for you to arrive.